Blanca Loya is a San Marcos native. Growing up near Stokes Park, she feels a special connection with the river. 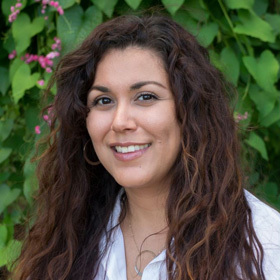 Blanca has a Master’s degree in Rhetoric and Composition from Texas State University and is now an instructor in the College of Education, Department of Curriculum and Instruction. She is a faculty sponsor in Best Buddies, which teams up undergraduate students with people in the community with intellectual or developmental disabilities to create friendships, and is also on the Tomás Rivera Book Award committee. She also serves on the Neighborhood Commission and has served of various committees for the City of San Marcos.